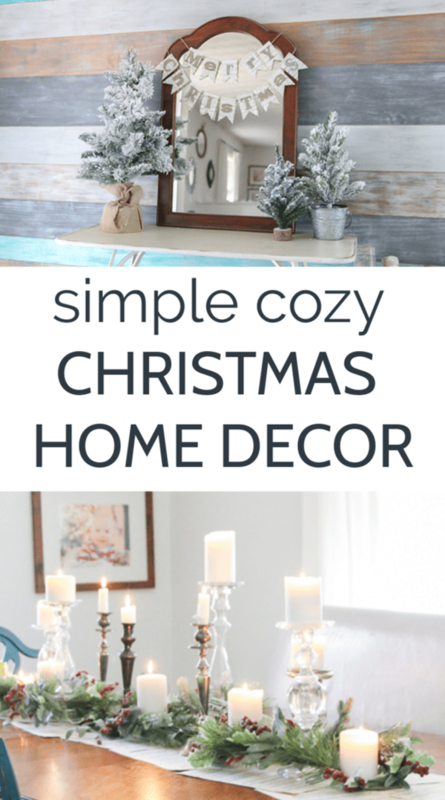 Simple Christmas Home Decor that Makes a Big Impact - Lovely Etc. I’m pretty sure Christmas decorating is the absolute best kind of decorating. There’s none of the hard stuff like figuring out furniture placement and paint colors. All of that stuff is already decided and all that’s left is adding a bit of sparkle and fun. And I think I like scoping out others’ Christmas decor almost as much as I like decorating my own home. 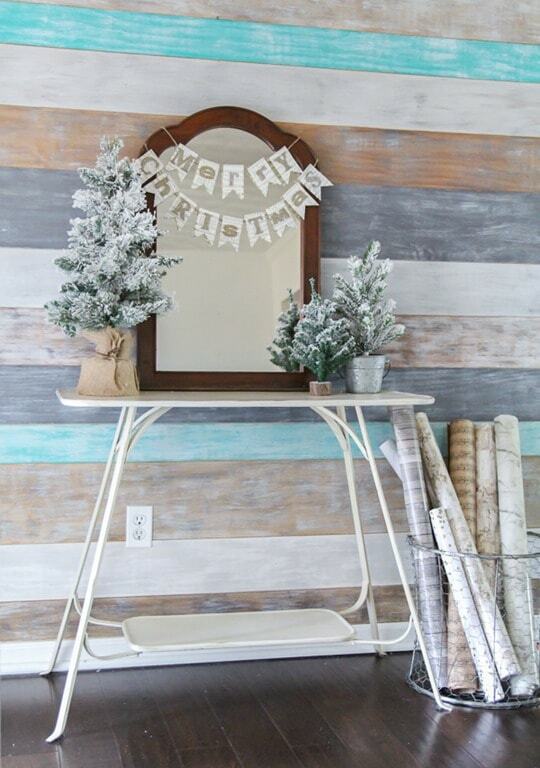 There are so many gorgeous ways to decorate for Christmas and I love them all. 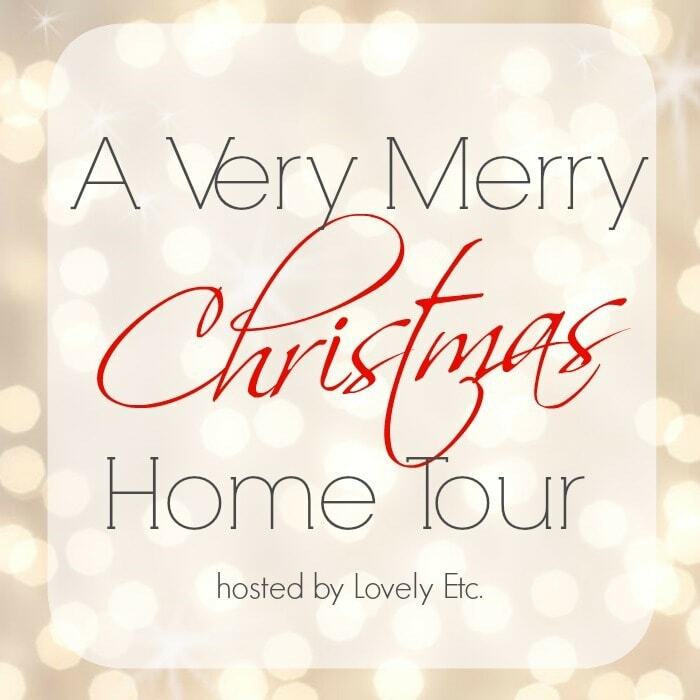 So every year I invite some of my favorite bloggers to join me in sharing our homes for the holidays. You can find links to my friends’ posts below, but first I’m excited to share my own home all dressed up for Christmas. If you are coming over from Up to Date Interiors for the first time, welcome! I’m so happy you stopped by! As much as I love Christmas decorating, I don’t want it to turn into just one more huge task on my to-do list. So I try to keep things simple while still making our home feel cozy and full of Christmas spirit. I absolutely love to see all of the Christmas touches others add to their bedrooms, bathrooms, kitchens, and other spaces. But for me, that just feels overwhelming, so I stick to a few key spots we see every day: our entry, our dining room, and our mantel. Gathering all of the festivity together in a few spots makes a bigger impact than sprinkling a little here and there. Plus, it’s a lot easier than trying to redecorate your entire house. Every year I change up our Christmas decor a bit, but I always challenge myself to use what we already own as much as possible. This year the only things I bought were two rolls of ribbon for our Christmas tree and some flowers for my buffalo plaid Christmas wreath. I pulled everything else from my stash – and most of it isn’t even specifically ‘Christmasy’. Instead I used lots of candles, some old sheet music, and a bit of greenery and I love how it came together. My entry is always one of my favorite spaces to decorate. This year I kept things super simple. My youngest, Lincoln, is in a phase where he loves to grab anything he can reach and carry it around the house, leaving it anywhere other than where it belongs. So I was determined to keep everything very simple and minimalist – the less stuff to pick up from all over the house, the better! 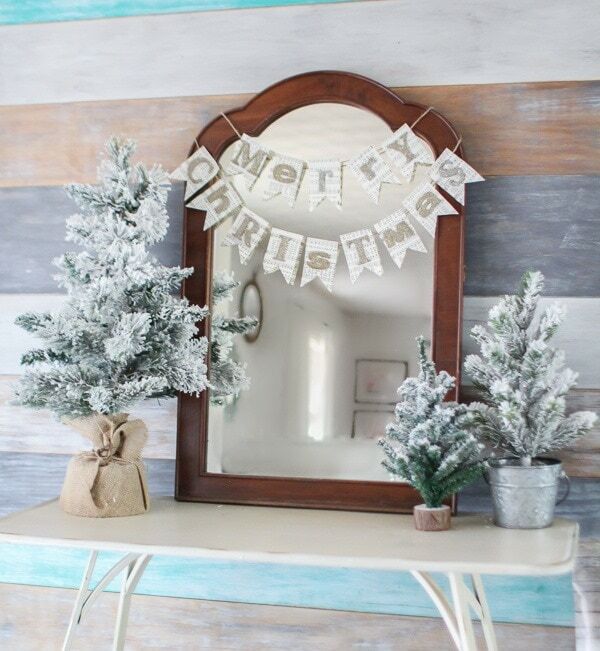 In the entry I added a vintage mirror with a sweet Merry Christmas banner and a few mini Christmas trees. I made the banner last Christmas using some pages from a falling-apart hymnal, chipboard letters, and glitter. And I added my favorite snow flocking to the little trees; I just can’t seem to get enough flocked Christmas trees! I added the basket full of wrapping paper so I can enjoy how pretty it is all season and also have it close by for late night present wrapping. So far none of my boys have really noticed it so fingers crossed it stays that way. I have visions of walking in to find a little boy joyfully unrolling every last roll. 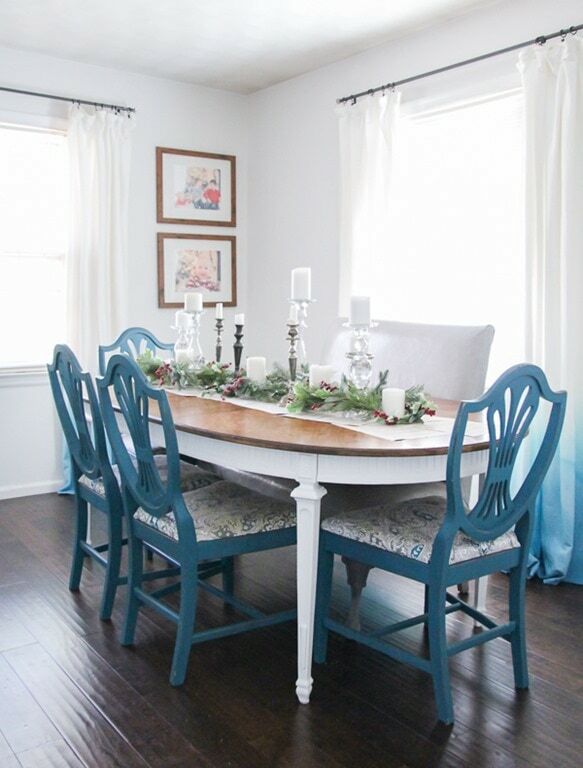 I was so excited to get to decorate my newly refinished dining room table for Christmas this year. I started with a simple DIY table runner made out of vintage sheet music. I simply scattered sheets of music down the center of the table, taping them together so they would stay in place. I bought my sheet music at a yard sale (like most of the things in our house!) but you can also get it on Etsy pretty inexpensively. 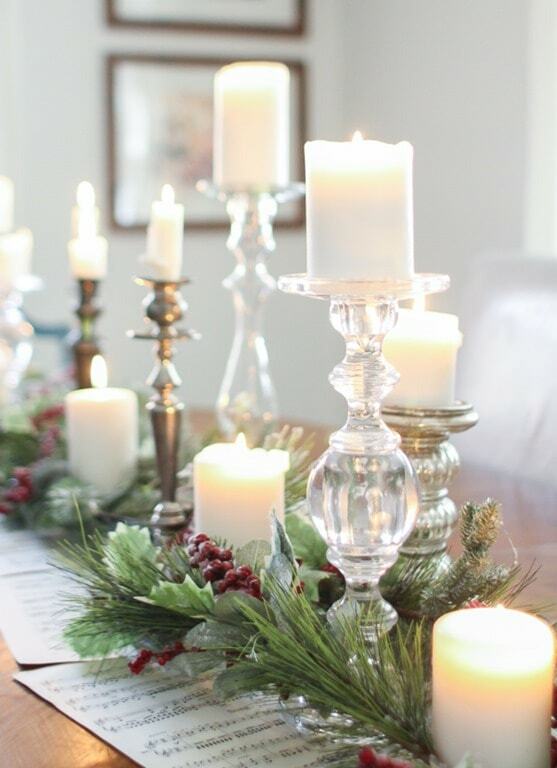 Then I gathered all of my silver and glass candlesticks along with a pile of white pillar candles and started arranging them down the runner. I have a major weakness for beautiful candlesticks and I’ve gathered quite a collection from thrifting. Candles are quickly becoming my go-to decorating staple. They always look beautiful and never go out of style or feel overly trendy. Finally I took a piece of Christmas garland, cut it in half, and wove the pieces between the candles. 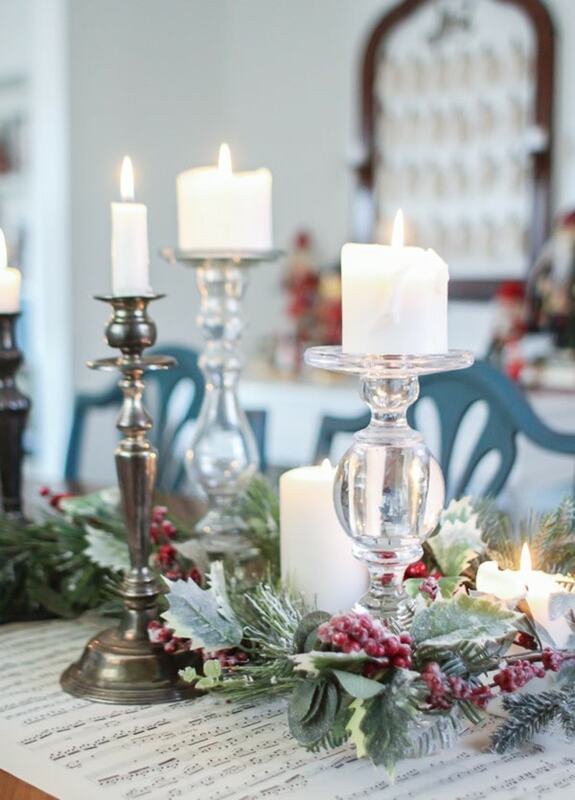 It’s a Christmas table centerpiece that is simple, elegant, and cozy all at the same time. I added a few other touches of Christmas to the dining room while I was at it. I switched out the family photos in the big frames around the window for some of my favorite Christmas photos of my kids. It’s a small thing but I love seeing memories from Christmases past everyday. 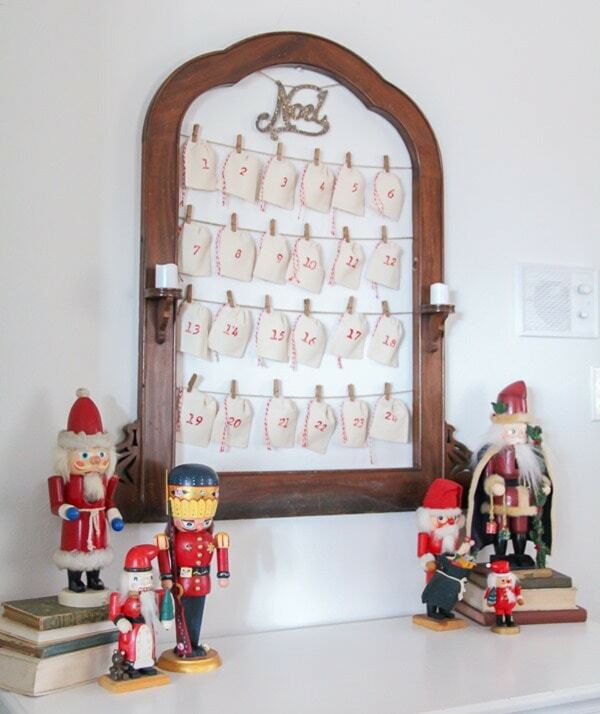 And I hung my DIY advent calendar in the dining room along with a few of our favorite nutcrackers. My husband’s grandmother started a nutcracker collection for him when he was little and I have carried on the tradition so now he has quite the collection. I’ve always loved the Santa nutcrackers best so I gave them a place of honor next to the advent calendar. I shared our pretty red, aqua, and buffalo plaid Christmas tree a couple of weeks ago, but I couldn’t resist sharing a couple more pictures now that I added a touch of Christmas to our mantel. And for the final touch, a few more favorite nutcrackers and a basket of firewood ready for making fires on chilly nights. Thanks so much for sharing a bit of Christmas with me! Next up be sure to head over to All Things With Purpose to check out her Christmas decor. And then check out the rest of the Christmas decor goodness at the links below. the Thanks Amanda! Honestly, I think ribbon is the hardest thing to do on a Christmas tree – half the time the tree ends up looking like a mummy wrapped up! Your home looks absolutely beautiful, Carrie. My favorite is your fireplace. 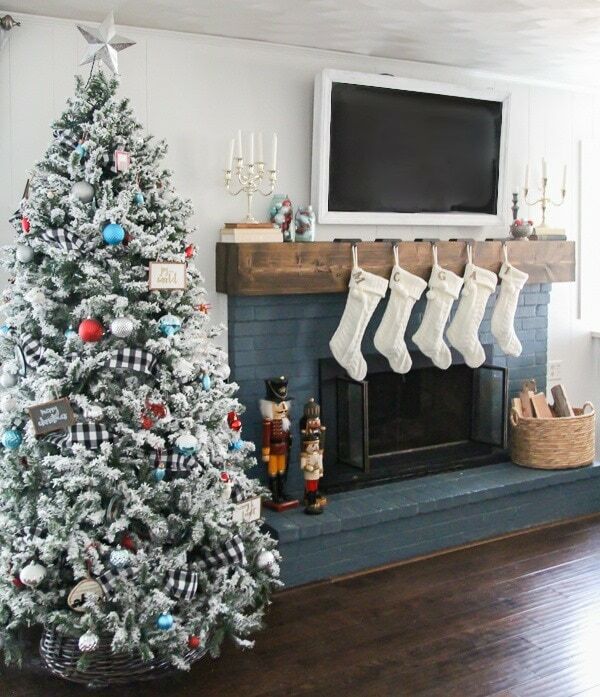 I love the combination of the wood mantel, painted brick and the way the white stockings pop against it. Happy Holidays! Thanks Sarah! Mine too – I love seeing everyone’s beautiful Christmas decor! Carrie I always love seeing how you incorporate your signature colors. I love LOVE your tree and your entryway looks fabulous! The dining chairs are gorgeous with your table centerpiece. Beautiful! Carrie! It’s gorgeous as always but my favorite part is that table runner you made. How creative and pretty!! And I’m super jealous of your ribbon wrapping skills – I’m terrible at it so I usually skip it. Your house looks so inviting and cozy! Thank you Melissa! 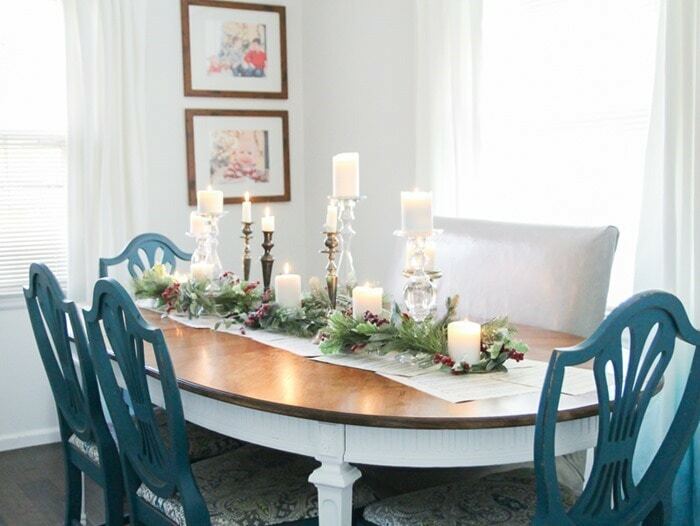 I love that table runner too – I can never find a table runner that looks right on my oval table so I just make my own! Thank you Gretchen! And I really don’t know why, but I definitely associate sheet music with Christmas. It just feels right I guess! Displaying gift wrap is brilliant! So festive and beautiful! I love your dining table decoration – especially those glass candles! They are just gorgeous!! Thank you Marly and I am so glad you could join us! Thank you so much Julie! You are so encouraging! Merry Christmas! Carrie, this is so pretty! I love how your Christmas decorating complements the rest of your home (I can never seem to do that!). Also your tree is so beautiful! I’m definitely going to have to try to convince my boys to let me try flocking our tree next year! Thank you Beth! It really is tricky to get Christmas decor to compliment your regular decor and is definitely something I have struggled with over the years! I’m glad it looks like I am starting to get it, lol. A girl after my own heart! Your blue tones and book pages have my heart pitter pattering all over the place. 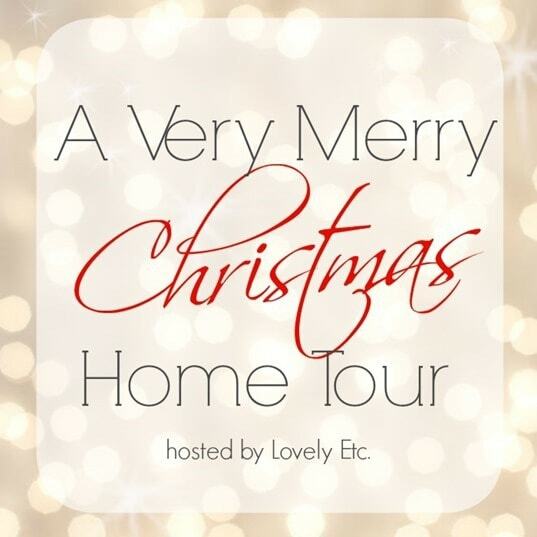 Thanks for sharing your welcoming home and for organizing an amazing Christmas home tour. Thank you Meegan! We definitely share a love for blue and vintage details!